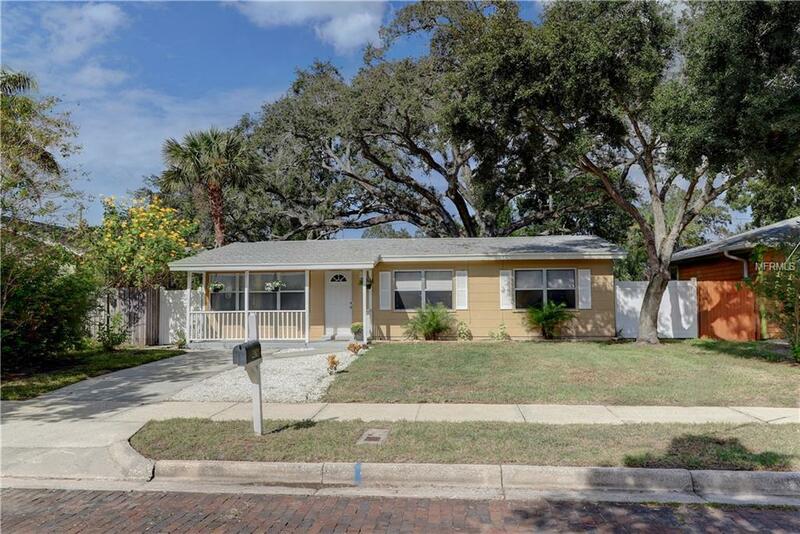 Primary residence, second home or rental property, this gem of a DUNEDIN HOME located on a RED BRICK STREET in a GREAT NEIGHBORHOOD can nicely serve any of those roles. Ready to move right in, 2017/18 renovations (permits on file) include FULL ROOF REPLACEMENT, FULL KITCHEN REPLACEMENT w/ALL NEW APPLIANCES, BATHROOMS (2), 40 GALL WATER HEATER, TILE FLOORS, CARPET, WHOLE HOUSE PAINTING (interior and exterior). 2 bedrooms PLUS an additional BONUS ROOM w/close to 200 sf, tons of natural light, 2nd bath, large closet, French Doors and new mini-split AC, which could serve as a perfect office, family room, den or 3rd bedroom. Laundry hook up conveniently located off the kitchen in the enclosed porch which overlooks the LARGE FENCED YARD. Start living the Dunedin lifestyle, which is truly second to none. NO FLOOD INSURANCE REQUIRED but only 4 blocks to the Intracoastal waterway where you will find amazing views and waterfront sidewalks. Just 1 block to the Pinellas Trail where you can walk, run or ride for miles! Walking distance to Dunedin Library, Toronto Blue Jays Stadium and less than a mile to HISTORIC DOWNTOWN DUNEDIN where you can enjoy a wide variety of amazing restaurants, waterfront activities, unique shops and events throughout the year including the very popular Dunedin Downtown Market. PRE-LISTING INSPECTION and APPRAISAL completed. This home is ready to go and priced to SELL.